JUMPSUITS – TAKE THE LEAP! 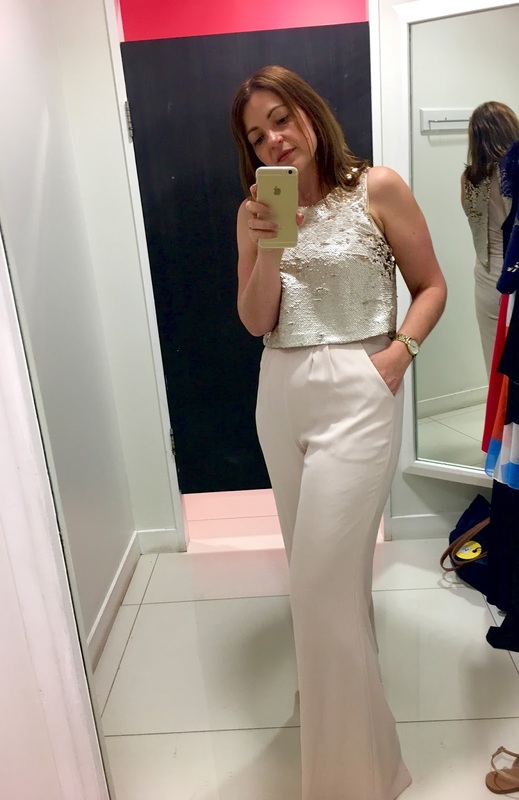 I was in the changing rooms at Karen Millen the other week and I couldn’t help but listen in on two ladies having a conversation about jumpsuits. Both of them were 40+ women, and I overheard their openness about their concerns in wearing jumpsuits. Their reasons were down to going to the toilet and how they thought their tummys were too big. 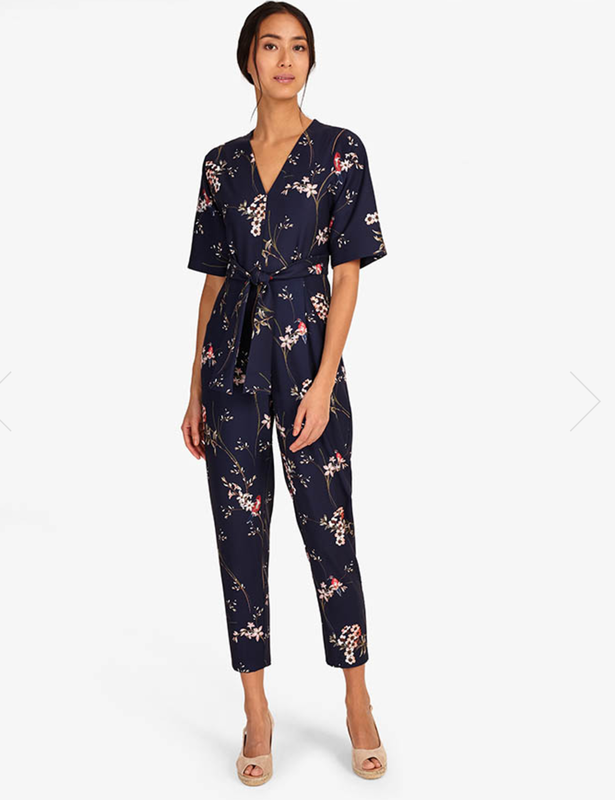 I get these reasons, but I think jumpsuits can be very flattering on a woman, and you know what, give yourself plenty of time to go to the ladies or pick a jumpsuit that you can get in and out of without any hassle, and they DO EXIST. So I’ve pulled this post together, to try and overcome some of these fears, if you are one of those scared to take the leap, I promise once you jump, you will never look back! 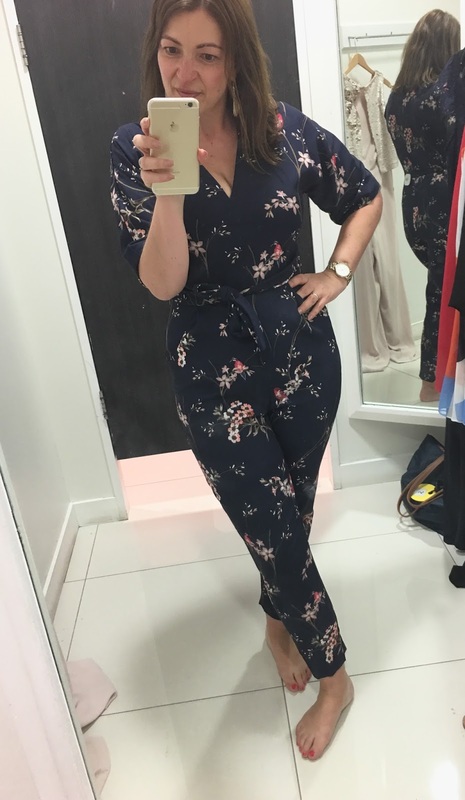 Now I could only do this shopping experience in a jumpsuit – or it would not have been fair! 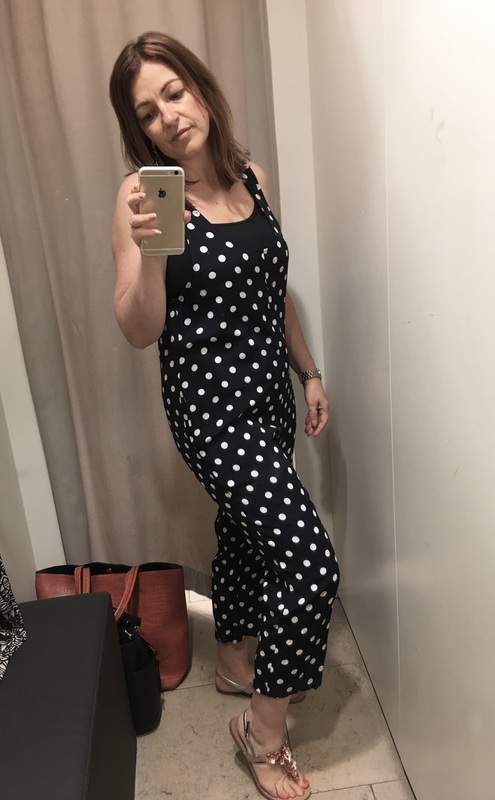 I took this jumpsuit on/off over ten times plus I also had two toilet breaks, the one I’m wearing has a back zip to middle shoulders and then two simple buttons at the top – it’s quick and easy to do. So first up is Mango, this one is not available online but it is in store and in the sale at £19.99 – because it’s patterned you don’t have to worry about lumps and bumps, the pattern disguises this. You may, like I did have to put a vest on under it, but I quite like this look. And as for ease of getting in and out – 10/10 you simply pull the straps down each side and that’s it, no zips or buttons. 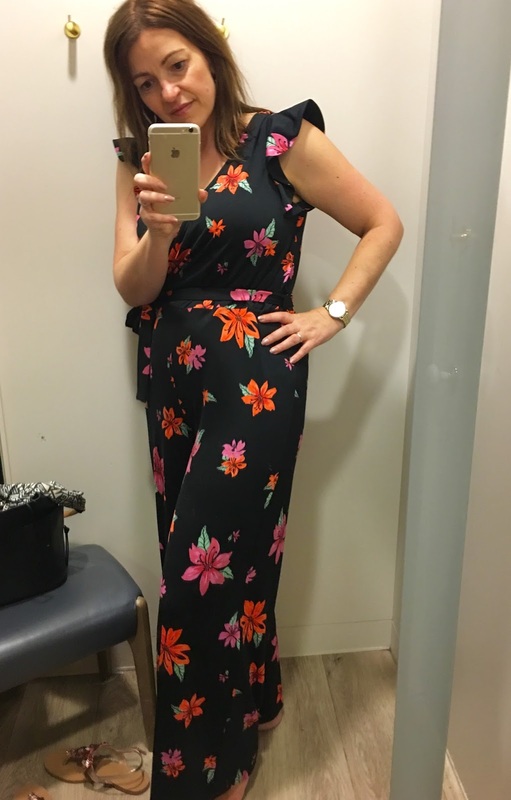 Next is from Phase Eight – my favourite jumpsuit I own is from this brand, and they do have fantastic choices in jumpsuits. This one I think is fabulous in colour and in print, and again very easy to get into (I’d give it 8/10) it’s also got a little discreet popper at the front to keep the top together, I do love it and it’s wearable day and evening, I’m just not sure that it’s worth £120. The one I’m wearing below is one size too small for me, so please do excuse the tighter fit, but I so wanted to show you this one. 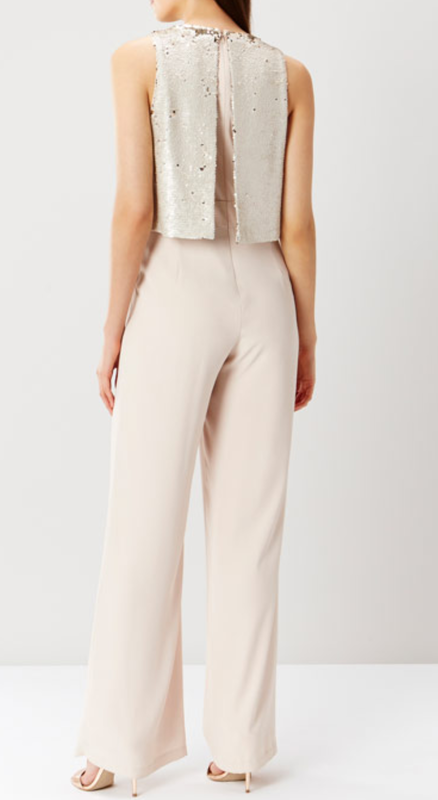 Up next is Coast with Lenox Sequin Jumpsuit, OMG this was lovely and not too bad to get in and out of, around a 7/10. It’s £139 and I think it’s worth it as the fabric felt lush and with all the sequins, this is perfect for an event or perhaps a posh garden party. The only thing I personally would have to change, is to have the pockets removed, as an hour-glass shape woman, pockets can completely ruin an outfit. I need to pop this one in from Monsoon – I couldn’t take a picture as the button at the top was broken and therefore I could get it to sit right – not an easy one to get in and out of (5/10), but very flattering especially around the waistline, and because of the detail around the shoulders, this naturally makes people look at your shoulders. The Cheryl Lace Jumpsuit I think is a steal at £69 – I was tempted, and re the toilet issue, I’d give myself plenty of time or take a girlfriend with me! 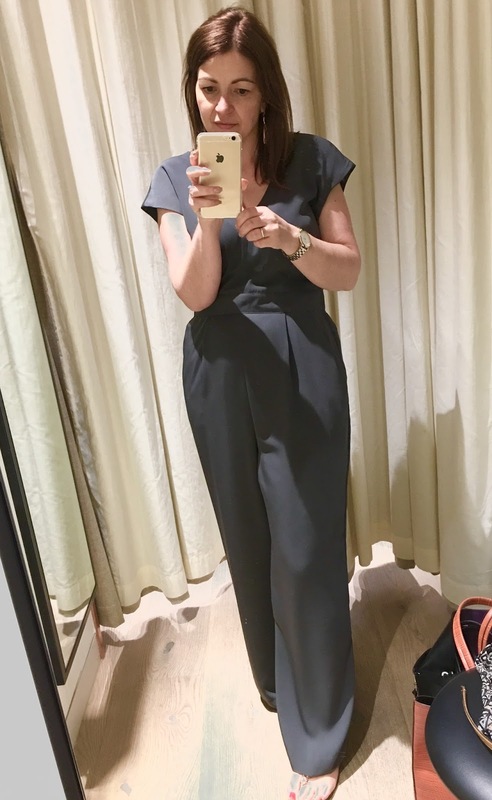 This Cap Grey Jumpsuit from Lindex is now in the sale at £24.95, down from £49.99 – I thought it was lovely, perfect for the office, and once I finally worked out how to get into it, a side zip can be confusing, it was actually not that bad, ease factor I think is 8/10. And then finally my last stop was M&S and I walked past this one and thought, yep that’s perfect. It’s a steal too at £39.50 – I have to say Per Una has been coming up trumps, that’s the same collection I got the Bardot dress. Now if I was buying one today, this is the one I would have purchased. Ease factor 10/10 you simply untie the fabric belt, pull the sleeves and then it drops, so easy!! And it looks I think, very glam for either day or night. Overall 10/10. So I’m hoping I’ve convinced you to give it a go, let me know if you do I’d love to know which one you purchased and how well you get on with it. 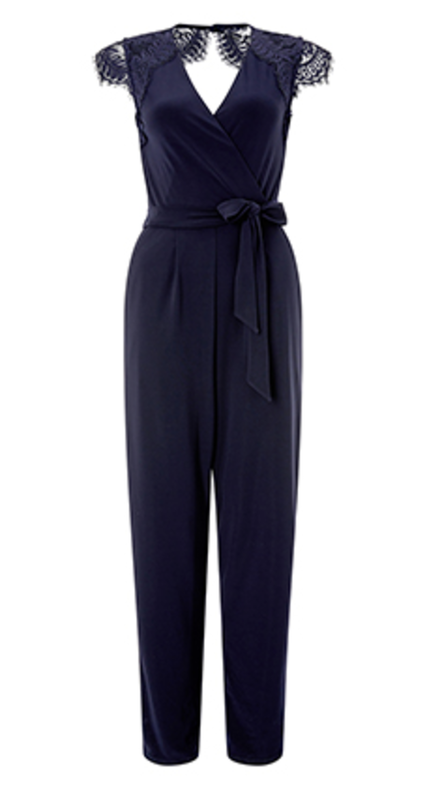 If you know of any other fabulous jumpsuits, let me know all about them too!! The post Jumpsuits – Take the leap! 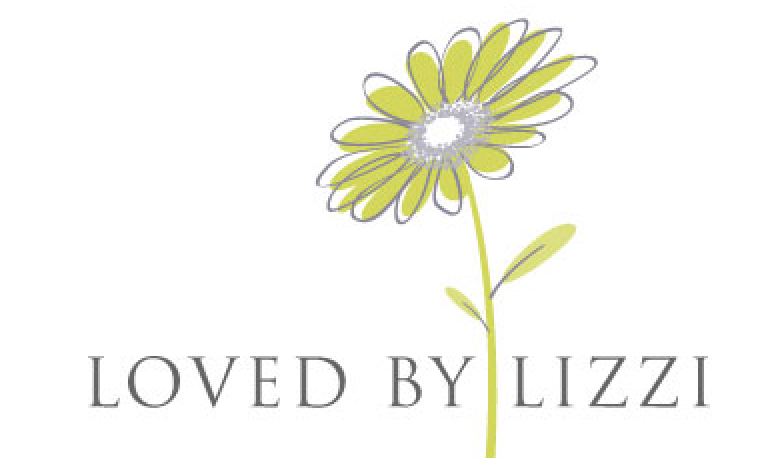 was on Loved by Lizzi first. Next Post Zara Summer Jackets – It’s Sale Time!